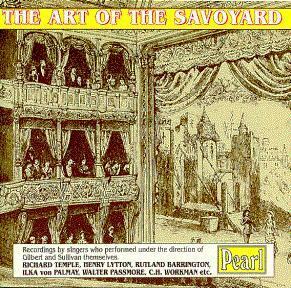 In 1973, Pearl Records issued a three-LP set called The Art of the Savoyard featuring recordings of "true Savoyards" — that is, singers who had worked directly with Gilbert and/or Sullivan. 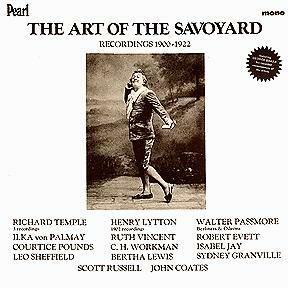 The recording was successful enough to be followed, a few years later, by a Volume II, a two-LP set featuring similar material. In 1993, highlights of the two sets were issued on a single CD. These recordings are indispensable, and I highly recommend the records (if you can find them), since the CD omits a considerable amount of material. It started when I was asked to review the LP of the Passmore Odeon Mikado, and I commented on the unusual rendering of Pooh-Bah's cadenza in "As in a month you've got to die". I speculated that singer had probably listened to Rutland Barrington singing this in the theatre and modeled his interpretation on it. I remarked something to the effect "This may be the closest we will ever get to actually hearing Barrington's voice". A week or so after this review appeared, my phone rang. It was a man called David Short whom I had met at a meeting of the Phonograph Society in London some months before. He had just read my review. He was a collector of cylinders, but was not particularly interested in G&S. He said "I've got a cylinder of Rutland Barrington". I nearly fell off my chair, but after getting further details, I put him in touch with John Wolfson, who sent Mr. Short a special pick-up to enable him to make a good tape transfer of the cylinder, from whence it was dubbed on to the Pearl LP. The rest, as they say, is history. AFAIK Mr. Short still owns the original cylinder, the only known copy of it. But the existence of the cylinder was apparently quite well known to cylinder collectors — it just happened that none of them were G&S fans, so had no idea of its significance to G&S historians. I checked up later in a catalogue of cylinders that I'd bought years before, but had never more than glanced at. There was the Barrington cylinder listed in black and white. BTW, there was apparently an H. Barrington who made a few discs in the very early days, but I have no idea who he was, nor have I ever encountered anyone who owns or has heard any of them. In any event, the Barrington item is just one of many treasures to be found on the five LPs that were issued in this series. In the lists below, the items included on the CD are indicated with an asterisk [*]. Note that there are some repeats between Volumes I and II, and there are a handful of items on the CD that are not on the LPs. [*] "I am a Pirate King"
"I am a Friar of Orders Grey"
[*] "Would You Know the Kind of Maid"
[*] "A Tenor Can't do Himself Justice"
[*] Merrie England: "The Yeomen of England"
[*] Chu Chin Chow: "When a Pullet is Plump"
[*] "Is Life a Boon?" [*] "Free From his Fetters Grim"
[*] "If You're Anxious for to Shine"
[*] "As Someday it may Happen"
"I Have a Song to Sing, O"
[*] "If You Give Me Your Attention"
"Oh Why am I Moody and Sad"
"I Once was a Very Abandoned Person"
"There Grew a Little Flower"
Reminiscences about Savoyards he worked with (one side). [*] "When e'er I Spoke Sarcastic Joke"
[*] "I'm Called Little Buttercup"
The Sorcerer: "The Curate's Song"
A Princess of Kensington: "Four Jolly Sailormen"
Much Ado About Nothing: "Sigh No More, Ladies"
Hawley: "The Sweetest Flower that Blows"
"If You're Anxious for to Shine"
[*] "My Name is John Wellington Wells"
The Talk of the Town: "If I Were Vanderbuilt"
The Circus Girl: "A Little Bit of String"
Florodora: "He Loves Me, He Loves Me Not"
Manon Lescaut (Auber): "The Laughing Song"
A Southern Maid: "The Call of the Sea"
Twirly Whirly: "Come Down Ma Evening Star"